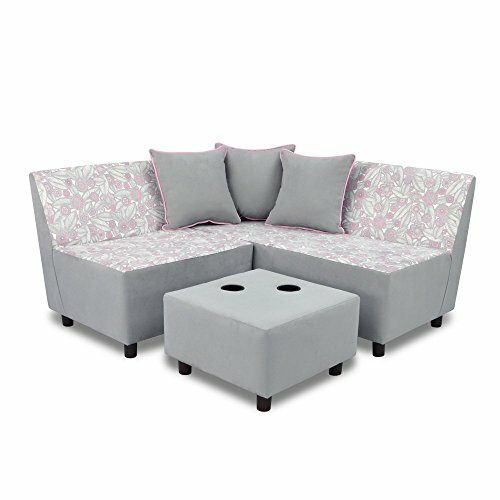 This appealing, new Tween Sectional Set features the new #3250-02-TPEBBGPEB Chair, Pillow and ottoman set and the matching #3250-03-TPEBBGPEB Chaise and Pillow set purchased together as a set,' The appeal of the Tribal Pebbles grey/pink/white color combination makes this a perfect item for many age groups and would work well in many room decors. These two units can be arranged as a corner sectional with the ottoman in front, or as a long bench seating arrangement with the chaise on one end and the chair placed beside it. The ottoman can then be placed in front of it. It may also be arranged facing one another with the ottoman between it.